View of Victoria, BC from the Executive House Hotel. Features the Inner Harbor, Parliament Building, Royal BC Museum and historic Empress Hotel. Sometimes, even we Seattlites feel the need to stretch our boundaries and get away for a weekend. Luckily, we don’t have to go far. Seattle is the perfect stage for the 2-Nation Vacation: start out in Seattle then jump the border for a rendezvous with our neighbors to the north. 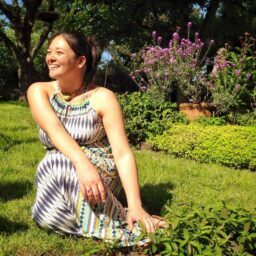 This summer, my boyfriend and I had a date with Victoria, BC. 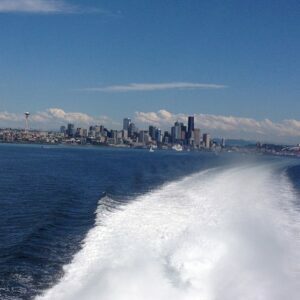 The view of Seattle from the Victoria Clipper makes the journey part of the adventure. Getting to Victoria from Seattle is a surprisingly simple task. We hopped on board the Victoria Clipper, a high-speed passenger ferry service that travels between Seattle and Victoria in less than 3 hours. It’s a fantastic way to explore the Puget Sound and view the shorelines from the Olympic Peninsula to the San Juan Islands. If you would rather view the landscape from above, you can opt to climb aboard Kenmore Air and travel by float plane. They will taxi out on Lake Union in Seattle and deliver you to Victoria’s Inner Harbor in just one hour. Victoria is an extremely walkable city and we carried our bags the short distance from the dock to the Executive House Hotel. Our one-bedroom suite on the 16th floor with ample room and all of the amenities for a comfortable weekend stay. It was really the view, however, that sold the room. The entire weekend we enjoyed sweeping views of the Inner Harbor, the Parliament building, the Royal BC Museum and the Empress Hotel. We visited at the warmest time of the year so we kept the windows and sliding glass door open whenever we were in the room and the sounds of street-side buskers and music from the carillon bells at the Royal BC Museum drifted into our room on the breeze. 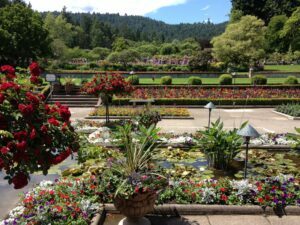 Butchart Gardens is a 30-minute drive from downtown Victoria. Luckily, tour buses are standing by for you right in front of the Empress Hotel. The location of our hotel was just about perfect and Downtown Victoria was immediately accessible just outside the front door. We were mere blocks away from the Inner Harbor, major museums, tours, and the Royal Theater (where we caught part of the Victoria International Jazzfest). We were also conveniently near Beacon Hill Park which led to an amazing waterfront trail with sweeping views of the Washington Peninsula and the Olympic Mountain range – great for my morning runs. Tip: if you have a dog, bring him with you! The hotel is pet friendly and the south end of Beacon Hill Park has an off-leash area with beach access – just a one-mile walk from the hotel. Although we were dog-less, we made many new four-legged friends. 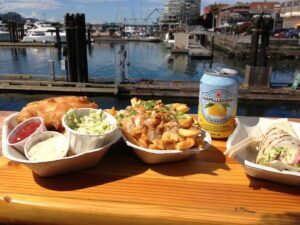 We waited in line for an hour to grab fish ‘n’ chips and seafood poutine at Redfish Bluefish. The wait was worth it. From whale watching to museum hopping, pub crawling to garden viewing, Victoria offers a great getaway location from Seattle. Stay for a couple nights or pop in for a day trip to reach your annual quota of fish ‘n’ chips. Either way, don’t forget to pack your walking shoes.